It’s called the Evergreen State, this amazing piece of America in the Pacific Northwest, and for someone flying in the way The Legal Genealogist did this week for the Northwest Genealogy Conference 2015 in Arlington, Washington, it’s easy to see why. From the air — and on the ground — even after a record-breaking heat-wave this summer — Washington State is definitely green — at least western Washington is (eastern Washington less so). 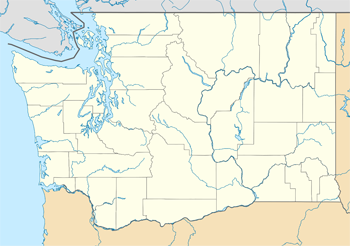 Eighteenth in size among the states, 13th in population, known for its timber and its aircraft industry, home of the Kennewick Man and the Space Needle, Washington State is also home to some truly amazing genealogical resources. The host society for the currently-ongoing Northwest Genealogy Conference is the Stillaguamish Valley Genealogical Society in Arlington. A vibrant active local society serving Snohomish County and the Arlington, Washington area, it has a library with more than 5,000 genealogical and historical books, microfilm and microfiche sets, that serves as a depot for historical information pertaining to north Snohomish County and the Stillaguamish Valley, and its native populations and early settlers. And it offers Internet access to free genealogy web sites. Our library is a depot for historical information pertaining to north Snohomish County and the Stillaguamish Valley, and its native populations and early settlers. • records relating to the Five Civilized Tribes. And it’s the regional repository for federal court records for Washington, Oregon and Idaho. So to say NARA Seattle is worth a visit is an understatement. The Washington State Archives has wonderful collections of information for genealogists ranging from territorial court records to vital records to photographic collections– and that includes some truly amazing digitized records we can all access sitting at home at 3 a.m. in our bunny slippers. I’ve already written about the unexpected treasures of the library of the Seattle Genealogical Society, with its amazing holdings from throughout the United States. But I was absolutely blown away by one reference source I just happened across on the website of the Washington State Genealogical Society, freely available to anyone who has even a smidgen of interest in research here in the Evergreen State. It’s called the Washington State Genealogical Resource Guide, originally created by Kathleen Allen O’Connor assisted by a grant from the Washington State Genealogical Society and now maintained by Charles Hansen. This guide consists of downloadable PDF files for every county in Washington State with a comprehensive overview of the resources available for research of all kinds. Each county’s PDF file begins with a brief history of the county, its boundaries, county seat and local resources like the Chambers of Commerce, courthouses, health departments and the like. It then adds information about local genealogical and historical societies and libraries. Then the file lists a wide variety of bibliographic resources for the county, ranging from atlases, gazeteers and maps all the way through to published sources for tax records. Published vital records, county and city histories and so much more are included in the lists. The file for each county ranges in length depending on the variety of resources to be found there. The PDF file for King County, for example, where Seattle is located, is 60 pages long; for Yakima County, it’s 23 pages; for Okinogan County, it’s 11 pages. This is a truly comprehensive and amazing resource for anyone with Washington State research to be done. So check it out — the Evergreen State has a lot to offer. Thank you. As I live in the Seattle area I was familiar with many of these sites, but you have added more and that Resource Guide will be very useful. But for recent surgery, I would be there with you at the NW Genealogical Conference in Arlington. Enjoy. Hope you recover quickly and glad I could point you to some additional resources! Hi Judy. I am glad you are enjoying the Pacific Northwest. Just thought I would tell you how pleased I am with your opinion of Stillaguamish Valley Genealogical Society as I was a “charter member” and spent several years enjoying and building the Society. Hard to believe it has been 30 years…hope it’s still around in another 30 years. Thanks Judy that resource guide is a hidden gem, too bad so few people ever use it. Had a good time at the conference, but almost did not come as I had told you I volunteered at the courthouse for 8 years. I actually do research for Eastern Washington Genealogical Society which takes me to the courthouse a several times a year, but in 2004 due to a new city being formed in Spokane county the county lost about a third of their income and so they were looking for ways to trim their budget and the county auditor (keeper of all the records except court records) sent a note looking for a genealogist to help them with record lookups, mostly marriage records, but also land and early birth and death records also, so for 8 year I did all the lookups for the auditors office. Now the auditors archive is empty, all the original records went to the state archives at Cheney and most of them are online. The auditor does have microfilm of all of them. The court records have been digitized, but they filmed the civil records originally including adoptions and so someone has to go in and purge the sealed records before they can be put online, and that is going very slowly. It’s a wonderful resource, Charles, and you’re to be commended for your work in keeping it updated. If you are looking for a fun Marriage Certificate go to the Washington State Digital Archives type in the given name King, surname Corn. This was for an Agriculture Fair In Spokane in 1913.